2011 Downtown Community Thanksgiving Lunch| Photos from the annual American Thanksgiving Lunch held in conjunction with the Downtown Community Ministry and the Wellington branch of the New Zealand Chef's Association at the Wesley Church Hall. 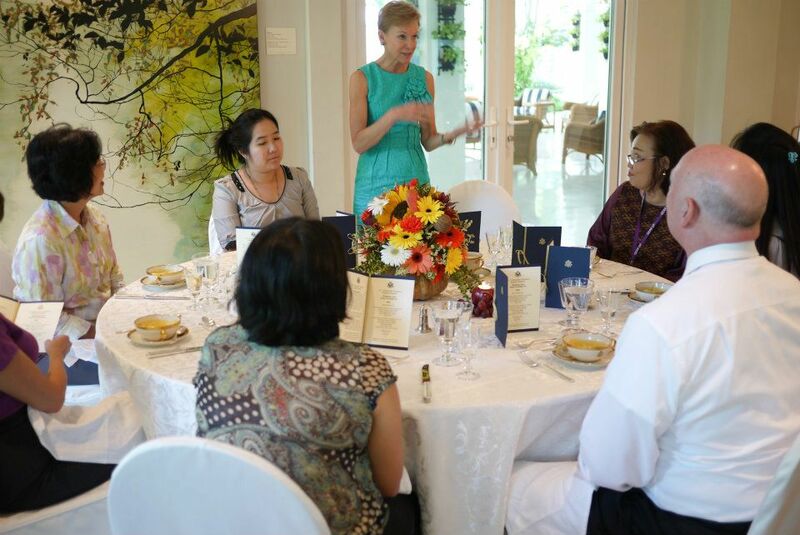 Thanksgiving Lunch at Ambassador Kristie Kenney's | Photos of the Thanksgiving lunch at the Ambassador's residence garnered the following comment on Facebook: "Would have been nice if the Ambassador and folks at the Embassy invited long term USA residents of Bangkok, who lost everything in the floods to dinner as well. Very crass of Excellency Kenney to celebrate with the "haves" while the "have nots" suffer. It is not going to be a very thankful holiday this year for some of us." To which Ambassador Kenney quickly responded: "No tax dollars used. This was my personal thanks to Embassy staffers for great work despite being flood victims themselves." On Thanksgiving Day, Ambassador Kenney also hosted fifty US military (army, navy, air force and marines) for dinner. They are all in Thailand to help with flood recovery efforts. Thanksgiving Day arrived with Occupy El Salvador protesting at the U.S. Embassy San Salvador "in solidarity with the 99% Global Occupy Movement." More here. Ambassador Gutman invited American sportsmen and women to his residence for a Thanksgiving do. Thanksgiving lunch for more than 300 staff and family members of the U.S. Embassy Kuala Lumpur. Turkey, pie, mashed and sweet potaties, corns and peas ... mmmmmm. Thanksgiving Day will have an extended run in Malaysia this year as the embassy will have a PUMPKIN PIE EXTRAVAGANZA open to the public next week with U.S. Embassy Officer Nelson Wu and other embassy staff! 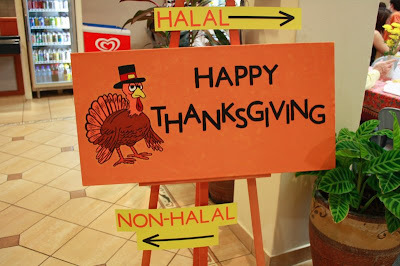 “It seems that Butterball’s best practices also permit it to produce turkeys that meet the requirements for halal food. 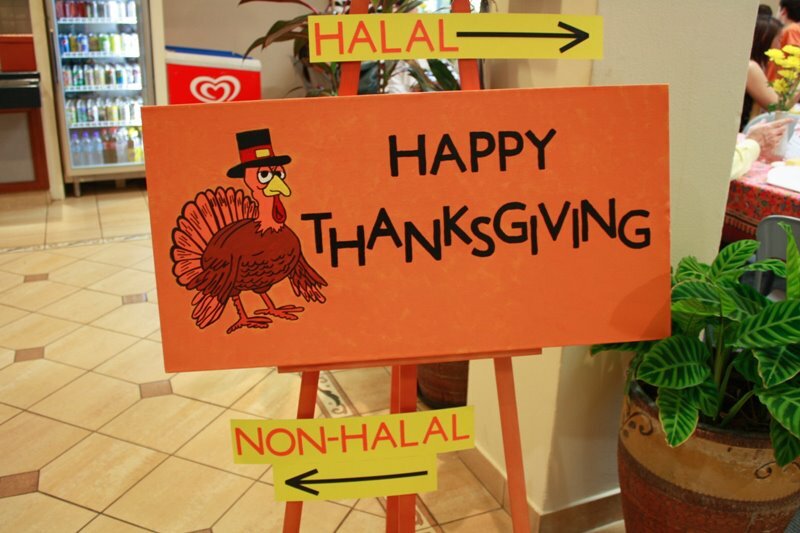 That is, its whole turkeys are deemed permissible for Muslims to eat. This, apparently, has caused Islamophobe Pam Gellar to go berserk. She somehow sees the fact that Butterball turkeys are halal as a stealth attempt to convert Americans to Islam. I won’t – on principle – link to Gellar’s writing, but here’s an indirect link through Outside the Beltway. Yes, she’s as nuts as that post makes her seem. Gellar has some really strange beliefs, quite laughable ones. Which led us to this most disturbing image of a suicide turkey ever. And Thanksgiving will never be the same again after this stealth infiltration.